This Sunday is Global Outreach Sunday at New Life Church. Stephanie Rogers (daughter of Wes and Shelley Rogers) will be sharing a brief testimony in each of our morning services and at length during the evening service. Stephanie is planning to go out as a missionary with Josiah Venture to Slovenia in January, and is in the process of raising support. If you would like to find our more about Stephanie's missionary plans, click here. Another exciting part of Global Outreach Night will be a live video interview with Hunter Haugen and Brian Buhler in India. 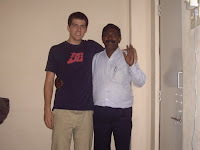 Hunter has been in India for almost two months on a short term trip helping Brian in his crucial work among the Dalit people. If you have facebook, you can check out Hunter's latest pictures here. Global Outreach Night will also include a touching video about the Middle School effort to raise money for Dalit Children, and a challenging testimony from a High School Student about the impact of a mission trip on a life. You won't want to miss this exciting evening. Global Outreach Night is this Sunday, November 8th at 6:00 PM at New Life Church Riverfalls. This was a great night. Thanks for your work and creativity!